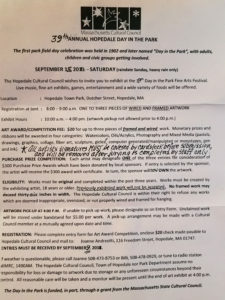 The 29th Annual Hopedale Day in the Park is on Saturday September 15th, 2018! 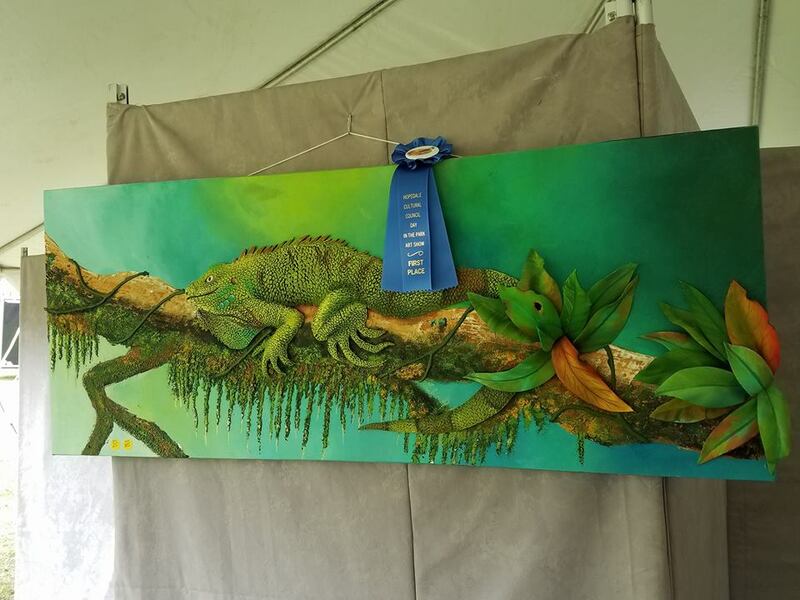 The Blackstone Valley Art Association regularly gets a booth at this festival in order to promote our artwork and membership. 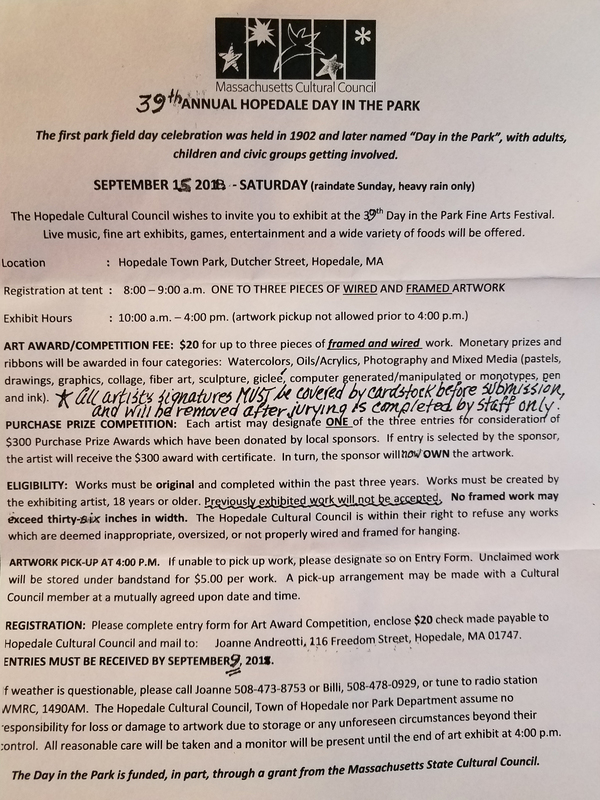 In addition, the Hopedale Cultural Council sponsors a HUGE art show at this event, under a big white tent. Many of our members routinely win prizes. Here’s an image from 2017 when our member Libia Goncalves won first prize. It is WELL worth entering this art festival. 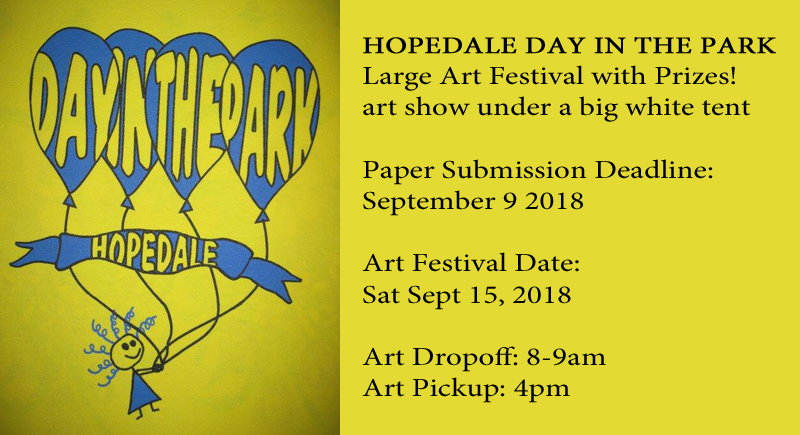 It’s a part of a one-day big festival on the Hopedale common with music, food, booths, and all sorts of things. The entry fee is $20. Here’s some details for entering. * ALL ART MUST BE FRAMED AND WIRED. * ALL SIGNATURES MUST BE COVERED BY CARDSTOCK FOR JUDGING. They’ll remove the cards later on, but when you bring your artwork in the signature MUST be hidden. That way the judging can be reasonably anonymous. * YOU MUST BE THERE BETWEEN 8-9AM FOR DROPOFF. Then they judge so you can’t be late. If you have a challenge with this, talk with us and we can coordinate with someone who is going in to bring your art in for you. * THE ART FESTIVAL AND OUR BOOTH ARE TWO SEPARATE THINGS. 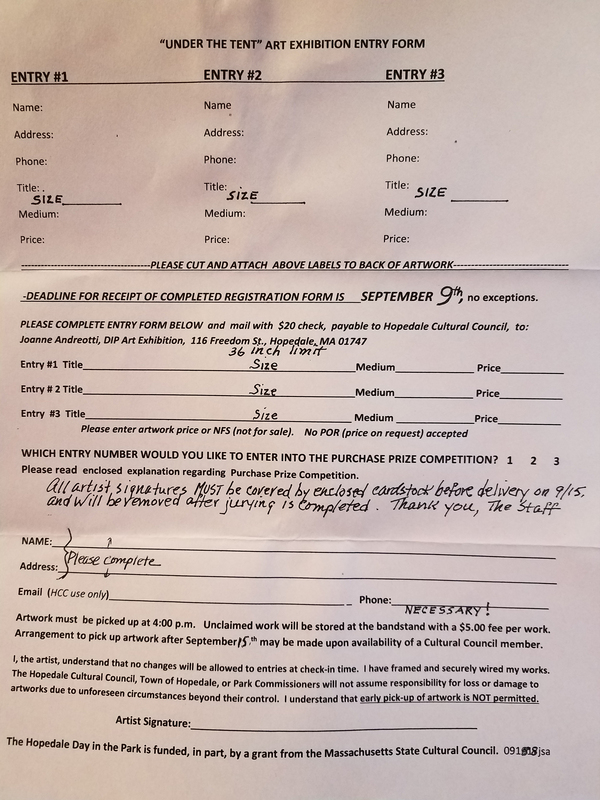 The art festival is run by the Hopedale Cultural Council and we all enter that show. In addition to that, we also have a booth at the event which we put our own art up in, for free. Our booth is best for smaller quick-purchase items, matted prints, and notecards. 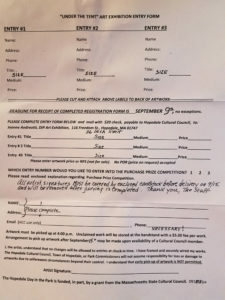 * YOU MUST SEND IN A PAPER FORM TO REGISTER. That has to be received by September 9th 2018. Don’t wait for the last minute on this one. Register early. Here’s the two pages for the paper registration. Print these out, fill them in, and snail-mail them to their destination. Ask with any questions! This is well worth entering.